Jenny is a 13 year old chestnut thoroughbred mare. 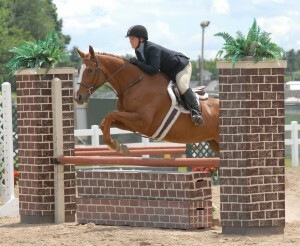 Shown on the Vermont Hunter Jumper circuit. She can jump 3-3’3ft. She does great in Eq/hunters/Jumpers! Always in the Ribbons including Champion/Reserve Champion. Jenny has attended the NEHC Finals in Springfield Mass. Also has qualified for Marshall and Sterling Finals! Jenny is very layed back, loves to be groomed and loves having a job. Great on trail ride as well! For more information about Jenny please contact us!